The amazing tales of the knight Theuerdank and his companion, Ehrenhold, comprise the last great epic verse of the late Middle Ages. The courageous knight’s journey to woo his future wife, Mary of Burgundy, and his triumph in battles and other perilous acts of bravery are the focus of this highly embellished "real-life" story of Emperor Maximilian I (1459–1519). A king of Germany before becoming Holy Roman Emperor in 1508, Maximilian was a great patron of the arts and commissioned a trilogy of luxurious illustrated books to immortalize his existence. Theuerdank, the only volume to be published during his lifetime, was composed by Melchior Pfinzing based on Maximilian’s rather fanciful draft. The 118 ornate, gold-adorned woodcuts―one for each chapter―were made by Hans Burgkmair the Elder, Hans Schäufelein, and Leonhard Beck, while the typeface (known as the Theuerdank typeface and marked by its striking “elephant trunks”) was especially designed for the book by the printing workshop of Hans Schönsperger the Elder. 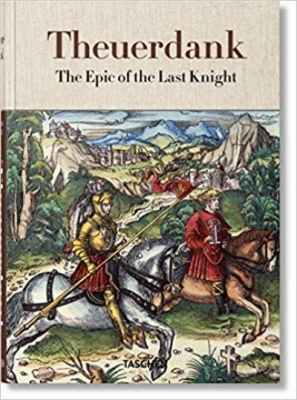 Theuerdank (named after Maximilian’s adventure-seeking alter ego) is both of great historical significance and exceptional beauty. Black-and-white originals dating from the 16th century occasionally surface and have fetched prices up to £35,000―but now the entire work can be appreciated, in stunning color and quality, at an accessible price. This complete reprint, made to exacting standards from an extremely rare hand-colored original from the Bayerische Staatsbibliothek, Munich, comes with an essay by Stephan Füssel (covering Maximilian’s life and work, as well as his role in the art of printing and use of printed materials) and selections from Melchior Pfinzing’s original clavis, or “key,” which was included in the original to kindly point out to Maximilian’s contemporaries exactly what part of the tales were more fiction than fact. The collection also contains a chapter-by-chapter re-telling of the tales in modern vernacular, exploring the narrative strategy and real events behind the allegories.